Quantity: An average of 14 pounds is needed per canner load of 7 quarts; an average of 9 pounds is needed per canner load of 9 pints. A bushel weighs 30 pounds and yields 12 to 20 quarts - an average of 2 pounds per quart. Quality: Select filled but tender, crisp pods. Remove and discard diseased and rusty pods. Wash beans and trim ends. Leave whole or cut or snap into 1-inch pieces. Hot pack or raw pack according to instructions below. 1. Cover beans with boiling water; boil 5 minutes. 2. Fill jars loosely with beans, leaving 1-inch headspace. 3. Add 1 teaspoon of canning salt per quart to the jar, if desired. 4. Cover beans with hot cooking liquid, leaving 1-inch headspace. Remove air bubbles and adjust headspace if needed. Wipe rims of jars with a dampened clean paper towel; apply two-piece metal canning lids. 1. Fill jars tightly with raw beans, leaving 1-inch headspace. 2. Add 1 teaspoon of canning salt per quart to the jar, if desired. 3. Add boiling water to the jars, leaving 1-inch headspace. Remove air bubbles and adjust headspace if needed. Wipe rims of jars with a dampened clean paper towel; apply two-piece metal canning lids. 4. 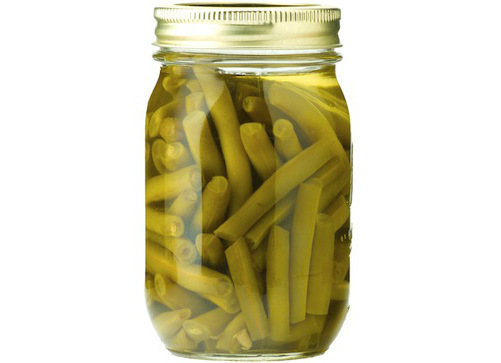 Adjust lids and process in a pressure canner according to the recommendations. Let cool, undisturbed, 12-24 hours and check for seals.